Celebrating two years in the egg business! Rodger with MozOvos manager Sr. Bule! MozOvos is two years Old. MozOvos Produces on average 275,400 eggs a month. MozOvos is saving $3650.00 a month for future purchses of birds and materials. MozOvos supports the International Internship in Mission at $1000.00 a month. MozOvos is slowly emerging as a wholesale and retail business that is competitive. MozOvos continues to seek excellence in all it does. 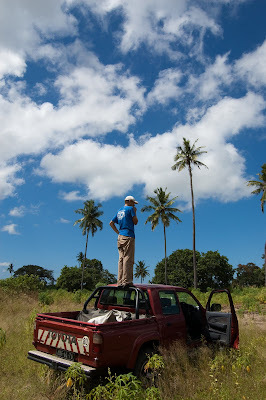 My ministry partner Rob at the new property in Northern Mozambique! MozOvos has purchased 25 acres of land in northern Mozambique for a future site of MozOvos and other business initatives. Rafael mentoring 1st year intern Manuel! Manuel teaching for the very 1st time! The International Internship in Mission is three years old. Challenged in work ethic and plans for future sustainability in life and ministry. Interns are growing in leadership and vision for current and future ministry. A few interns being mentored to take on new leadership responsibilies as the Internship grows and as we prepare to receive 8 new interns in January. Plans are developing to reproduce the Internship leadership model in northern Mozambique among the Makhuwa people on and close to the Island of Mozambique. So grateful to lead such a wonderful group of people; MozOvos, Internship and WorldVenture, Mozambique. We continue to be humbled through our weakness and thankful that the mercies of others and the Lord are patient and gracious as we learn to lead. The WorldVenture, Mozambique team met together in south central Mozambique for three days of prayer, worship, business and Easter services. An amazing time together as a mission family. Our growing team is such a huge blessing and encouragment to the work in Mozambique. Go Moz! Rodger and Lynne celebrating 19 years of marriage! Thank you Lord for the life for which we have been called. To God be the Glory!